“He said to him, ‘What is your name?’ And he said ‘Jacob.’ Then he said, ‘Your name shall no longer be called Jacob, but Israel, for you have striven with God and with men, and have prevailed’” (Gen. 32:27-28). 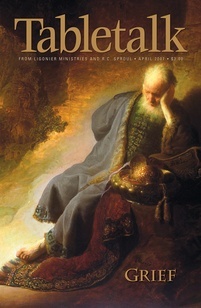 Jacob has not only prevailed in grappling with men (Gen. 29–31), he also clings to God as he wrestles Him. Bruised by the Lord, Jacob will not let go until Yahweh blesses him (32:26). The Lord does not let Jacob’s past define him. Instead, He forgives and no longer hold’s Jacob’s sin against him. He renames Jacob Israel (32:28), which loosely means “El (God) fights.” In the history of the nation of Israel, the Lord fought with and for His people (Ex. 14; Jer. 1:13–19). He also warred against Israel when He judged her through pagan armies (Judg. 2:11–14; Jer. 21). Jacob’s new name hints at this future, but we are also told he is called Israel because he has prevailed in his struggle with God and men (Gen. 32:28). This being the case, how did Jacob prevail in his struggle with the Almighty if he cried “uncle”? Understanding that the Lord wrestles with us whenever we are tempted or face trouble helps us answer this question. Though perfectly holy and never Himself the author of sin (James 1:13), God is sovereign, and any evil that attacks or tempts us only comes by His permission (Isa. 45:7; 1 Cor. 10:13). Therefore, John Calvin comments, to fight against such things is in some sense to do battle with the Lord’s hand since He allows trials without being guilty of sin (for our good, Rom. 8:28). Jacob prevailed in this battle by admitting His guilt and absolute dependence on the Lord, clinging to Him with all his might. Such cleaving is the only way we can prevail with the Lord and trust Him to work for our good even when life is tough. When God sends trials our way, He is not working against us. He also delivers us from the travails He permits (Pss. 18:2; 74; 79; 1 Cor. 10:13). Calvin writes that “inasmuch as he supplies us with more strength to resist than he employs in opposing us, we may truly and properly say, that he fights against us with his left hand, and for us with his right hand.” Let us imitate Jacob and cling to Him for blessing so that we may see the good things He has for us.